Last weeks Polka Doodles challenge is to follow a sketch. 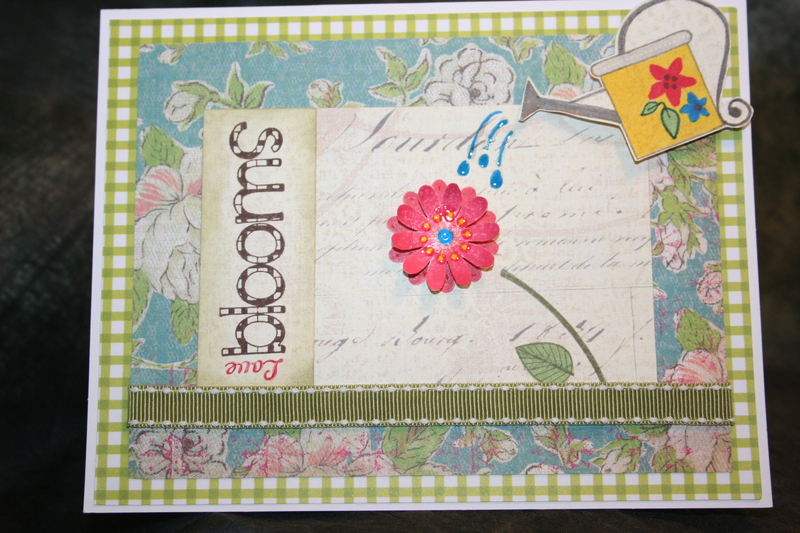 I used a “new” to me Stampin’ Up set. 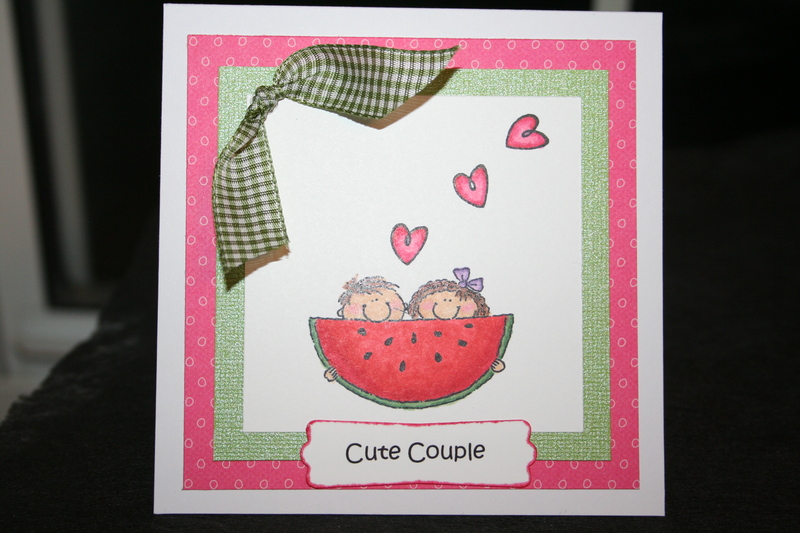 I thought it would make a cute anniversary card for my sister and her husband. Paper is from Bo Bunny and Bazzill. I used my copics to color the image. The sentiment is of my making on the computer. 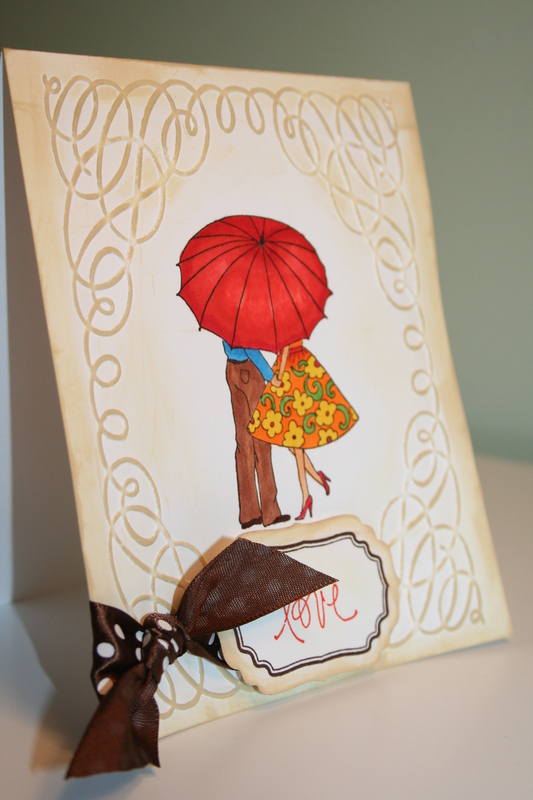 I made this card for my husband using the 2S4Y sketch of the week. I used a grey paper for the background. 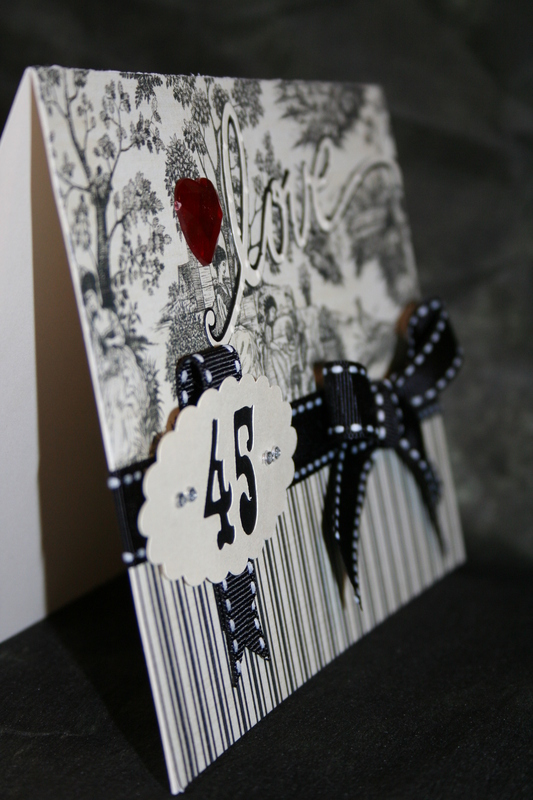 Then layered a slightly smaller piece of grey heart paper (what you see in the cut outs) over that. Then I cut hearts out of piece of white paper that was the same size as the grey heart paper using my Cricut and the Plantin Schoolbook cart. 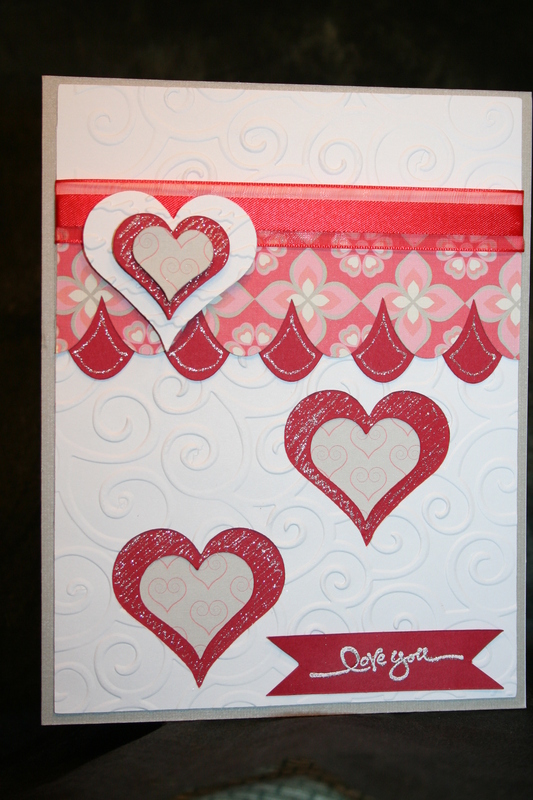 Before layering it, I cut slightly smaller hearts out of red paper and attached to the back of the white paper. Next, I cut two borders using the Plantin Schoolbook cart and offset them and attached them to the white paper. Then I attached the red ribbon. 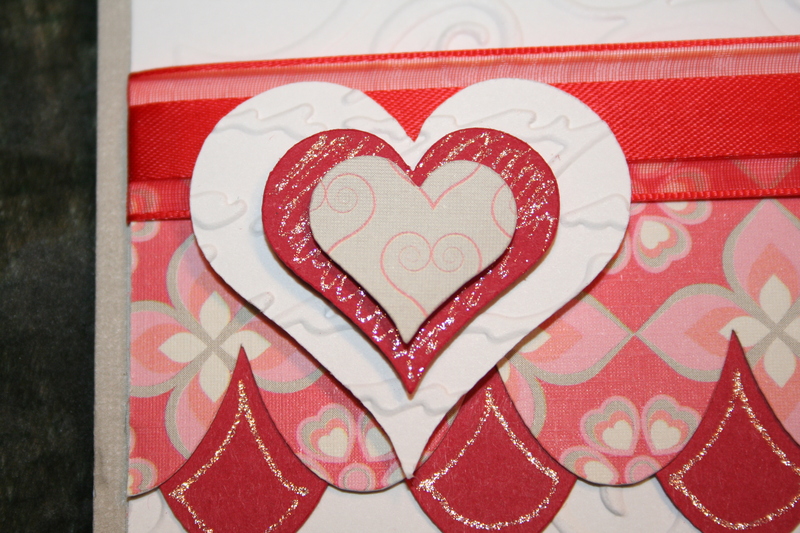 Using the cut out hearts I reversed layered them and popped them up. 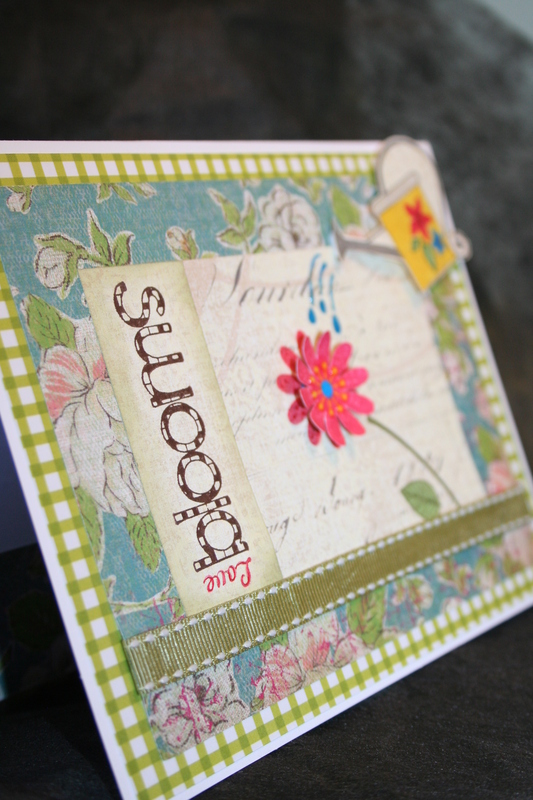 Finally, I used a Stardust pen to add accents and stamped the Love You sentiment (Stampin’ Up). Thank you for your kind comments and feedback! My 6yr old son is always “helping” my husband play Zelda on the wii (I have no idea what this is). They play in the room next to where I craft so I hear them all the time. Jacob’s answer to every obstacle in the game is to “bomb it!” However, this is rarely the solution. Tonight it was, and he felt so smart! I have been away from the craft table for too long! Just been busy with work, kids and hubby! Thought I would get back into the swing of things with the 2S4Y challenge this week. 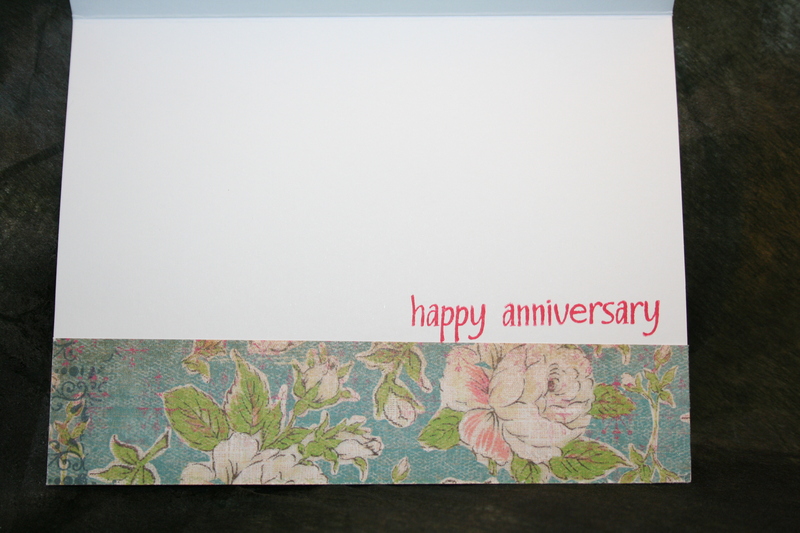 I made an anniversary card for my good friends. 14 years. We are going with them to Maui to celebrate! Can’t wait…can you image what the 20yr will be like?! Hope I get asked to go on that one too! The stamp are from Stampn’ Up and Unity. The paper from My Minds Eye. Hard to tell but the watering can is popped up as well as the flower. 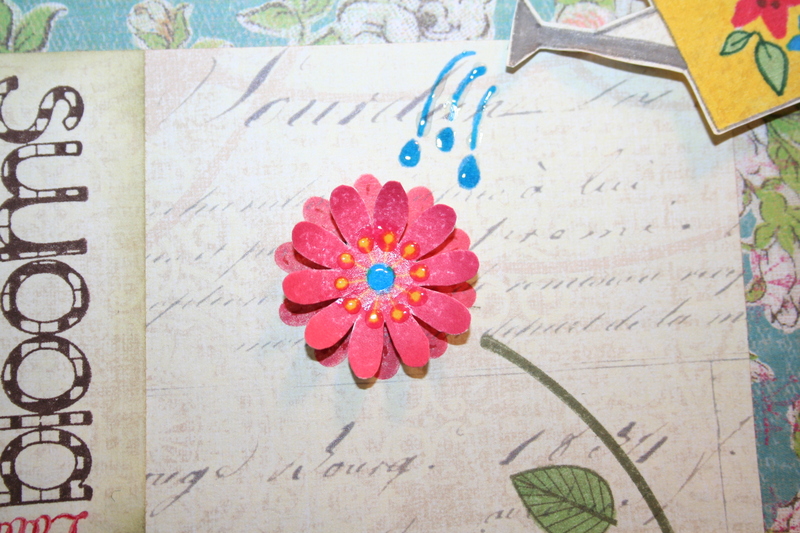 Also, I used stickles on the inside of the flower and the water to make it shiny. My work awards its employees with prize points. I rarely use it for myself (there is never anything good). This year the Company switched award providers. Guess what? I got a Gypsy, Copic markers and a couple of Nesties with my points! Now I can’t wait to get points so I buy more craft stuff! My next purchase is some new Cricut Carts! As always, thanks for your kind comments and feedback! Have a terrific and reflective Memorial Day weekend! It’s my in-law’s 45th wedding anniversary (can you imagine!). I made them this card in practically no time. I love it when I am inspired, have all the materials on hand, and know where to find the cuts I am looking for on my cartridges! It doesn’t happen very often. I stopped by their house last night on my from taking my girls to their gymnastics meet (which they did awesome at!). My in-laws love vintage things. They have a butcher block table that was in my father-in-law’s father’s butcher shop. It’s got to be over a hundred years old! Not to mention the sentimental value and memories it brings back for him. 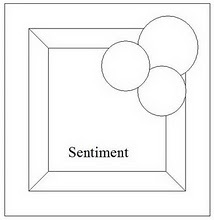 That is what inspired my paper choice. 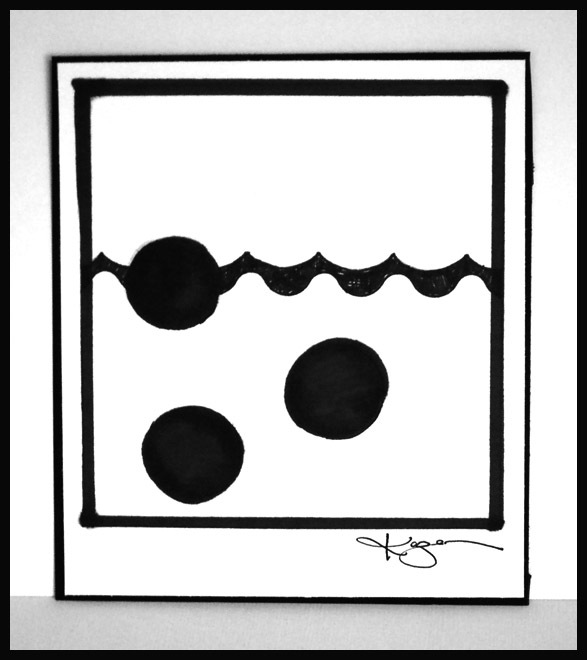 I cut the toile paper at 7″x 3″ and the stripped paper at 7″x 2.5″ then overlapped them on a blank cream-colored card. Then I tacked down my ribbon and made a bow. 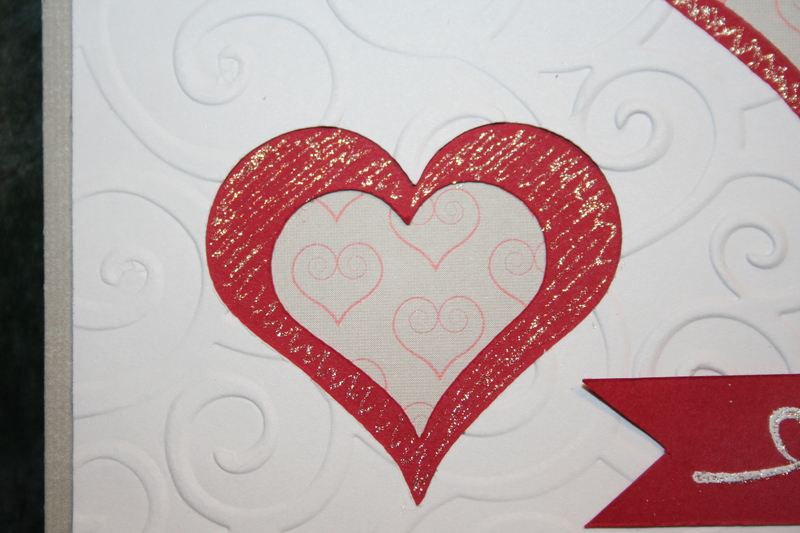 I used the “love” cut from the Home Decor cartridge in both shadow and regular cut. 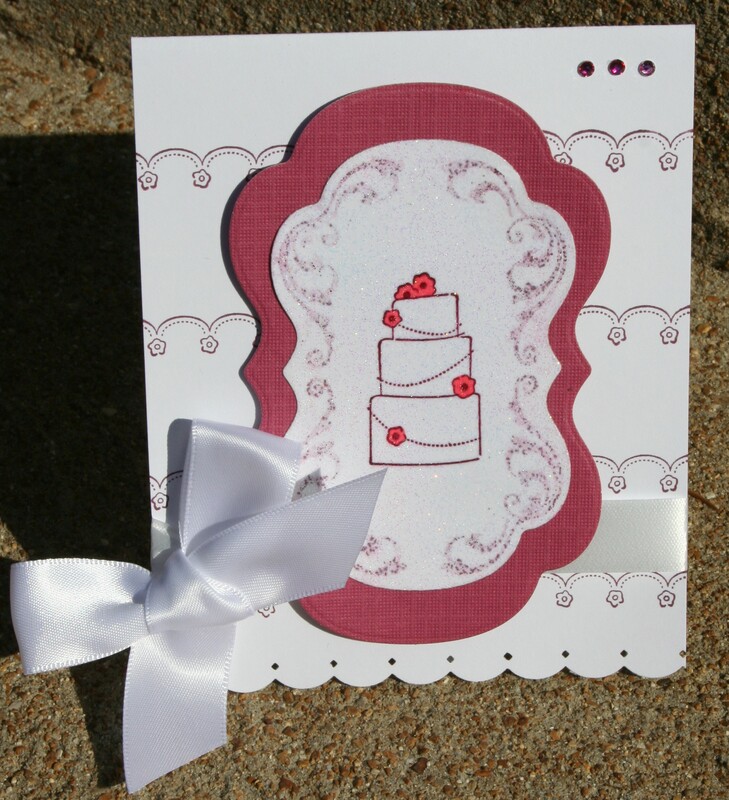 Then cuttlebugged the cream cut a couple of times with the dots embossing folder. 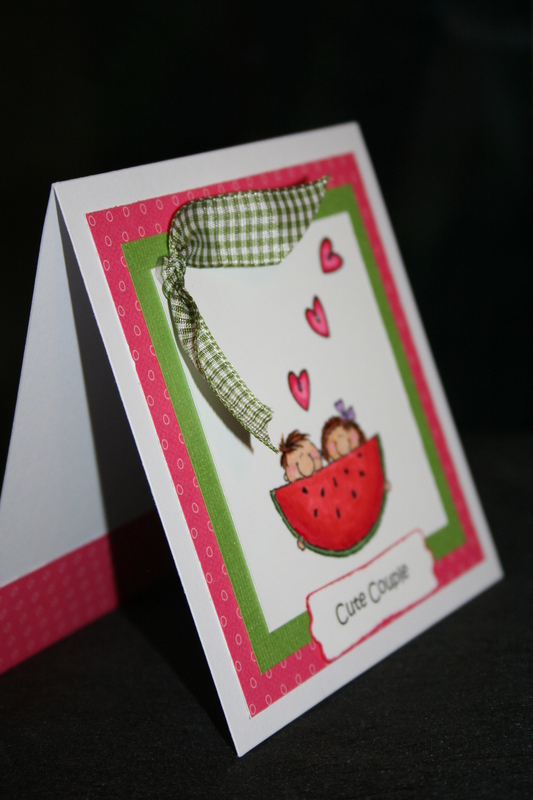 I cut the scalloped oval and “45” using the Storybook cartridge. Using my Design Studio (use it all the time!). I placed the “45” inside the oval and set it to cut. It came out exactly as I envisioned! After placing a little square of black under the scallop I attached it to the folded ribbon. 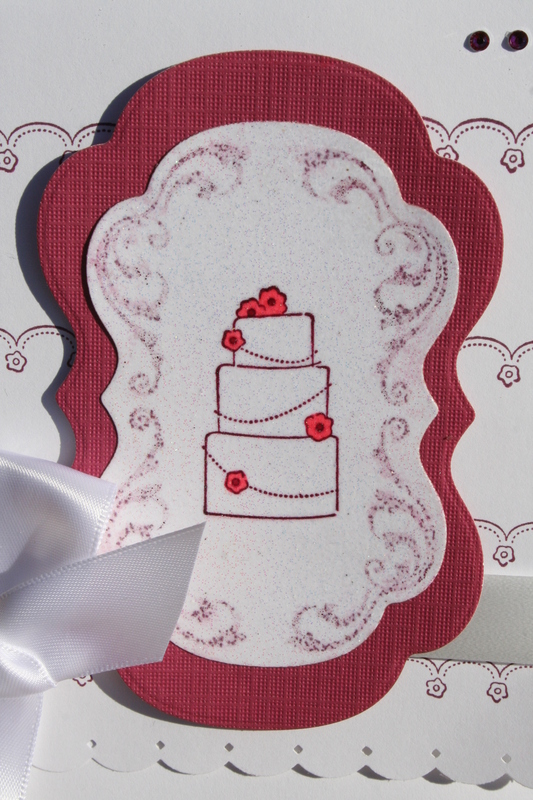 I didn’t have to use pop dots when attaching it to the card because the ribbon gave it a nice lift. 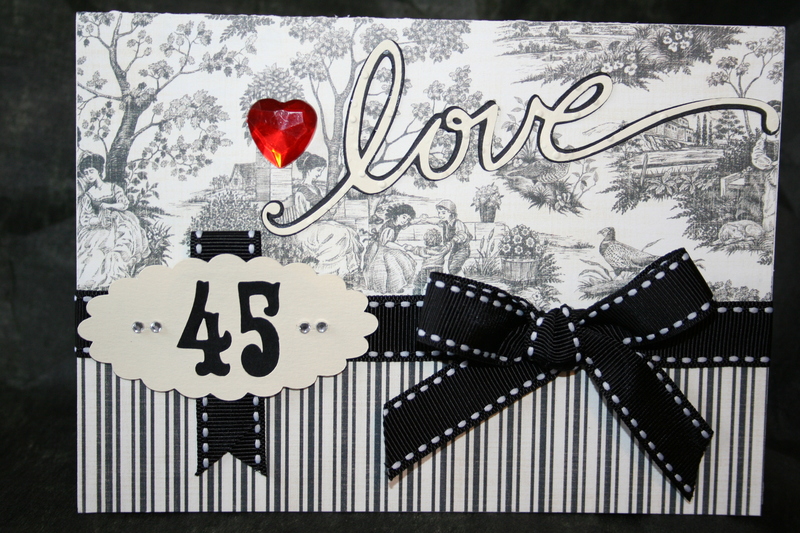 Once I attached the die cuts to the card I felt it needed a little bling, after all it’s been 45 years! I added the red jeweled heart by the love and 4 little crystals by the 45 on the oval. 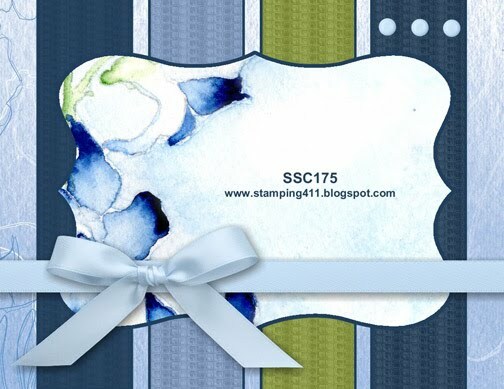 For the inside I use the toile and striped paper layered on one another along the right side of the card. I thought a sentiment on the upper flap was perfect as it was set off by the ribbon. Now I had the entire left side of the card to leave a nice message. 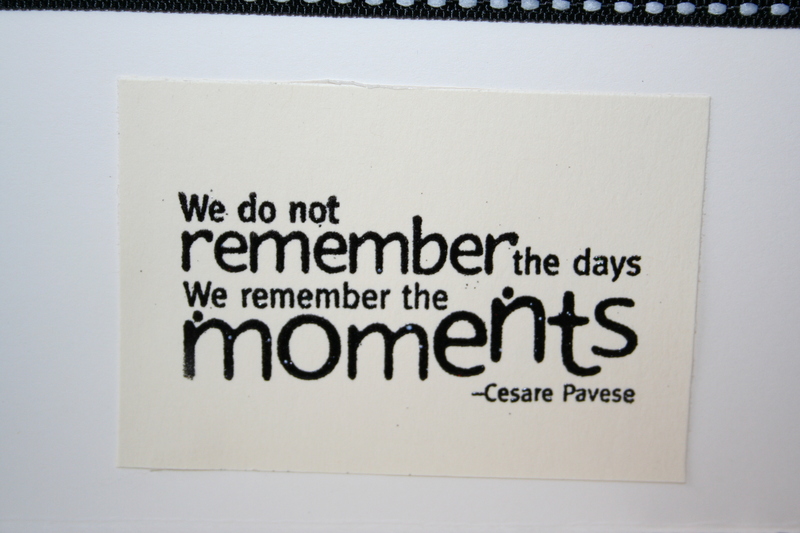 I thought this sentiment (Unity stamps) was perfect as there are hundreds if not thousands of memories in a 45 year marriage to reflect upon. Thanks to everyone who has left such nice comments it helps me to continue to grow in this fun endeavor!